There is a sensation associated with the insertion of an acupuncture needle, but very few people would call it painful. Most people feel a mild pinch or prick when the needle is first inserted. Once the needle is in, there may be a mild dull or tingling sensation around the point or extending to other parts of the body along the energy pathways. This sensation often brings a deep state of relaxation over the body. Because everyone has a different level of sensitivity, I use a wide variety of different gauges and styles of needles. I work with each patient to find the needle that is most comfortable and suitable for their level of sensitivity and their individual condition. 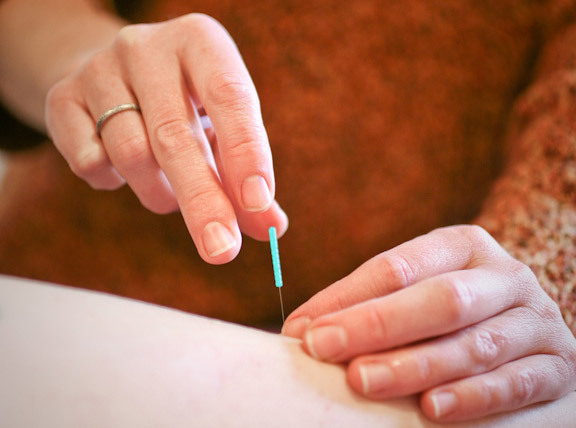 Even the most needlephobic people can enjoy and benefit from acupuncture! This is one of the most difficult questions to answer because it depends on many different factors. In general, the longer a person has had the condition, the longer it will take to treat. After an initial consultation, I talk with each patient about how long I expect the treatment to take, and how frequently I would recommend receiving treatments. For most conditions, I recommend that person begin with 4-6 weekly visits. Many conditions will resolve within that time, and most others will show definite improvement. East Asian Medicine is a complete system of medicine just like Western Medicine. A person can go to an acupuncturist for any condition for which one might see a Western physician. Western medicine is better suited for certain health issues; Eastern medicine is better suited for other health issues. Many times an integrated approach provides the most complete care. I have several years of training in Western biomedicine, and I am well qualified to recognize conditions that require Western medical care. I consider it my job to provide for you the very best healthcare and health advice. If I feel that you need care or advice that I cannot provide, I will recommend and assist you in finding the appropriate care for you. In this country we are lucky to have so many wonderful healthcare choices, and we have the ability to create an integrated approach to our wellbeing that can utilize the best of all medicine. If you have questions about whether acupuncture is right for your condition, I would be happy to talk with you. Acupuncture is only one technique in the system of East Asian Medicine. Other techniques include Chinese herbal medicine, nutrition, exercise (such as Tai Chi and Chi Gong), Tui Na (a form of massage). All of these modalities are based on a view of the human body that is different from our Western model. Traditional East Asian Medicine diagnoses illness based on imbalance in the organ systems and their related energetic pathways (called meridian) of the body. Treatment via any of those previous modalities is aimed at rebalancing the energy (or Qi) in those meridians, and therefore in the organ systems. This is why, for example, treating a point on the Stomach channel on the leg can affect digestion. From a Western perspective, acupuncture has been shown to induce various physiological responses in the body such as a change in hormone and neurotransmitter levels, blood cell counts, etc. In one MRI study, the stimulation of a point on the leg often used for certain eye problem was shown to cause activity in the optic area of the brain. How much does it cost and does insurance cover acupuncture visits? My fee is $95/initial visit and $80 for each subsequent visit. An initial visit lasts for 2 hours and all follow up visits last approximately 1 ½ hours. Most insurance companies in Massachusetts are not yet covering acupuncture, but there is a movement in that direction. I encourage patients to work with their physicians and insurance companies to request coverage. I do not currently bill insurance companies, but will provide detailed receipts and any additional documentation your doctor or insurance company requests if you wish to attempt to submit for reimbursement. Many workmen’s compensation and personal injury claims will pay for acupuncture visits. A first visit lasts approximately 2 hours. First, we’ll talk about your main complaint. Next, we’ll go over a complete health history. I’ll ask questions — some may seem “unrelated” to your complaint, but symptoms that appear irrelevant may be significant in determining the overall pattern of imbalance that is causing your problem. Then, I’ll answer all of your questions. I’ll feel your pulse in three positions on each wrist, and look at your tongue. The tongue and pulse are diagnostic tools that help determine the pattern of imbalance. Next, I’ll talk to you about what I think this pattern of imbalance is, and together we’ll determine a course of treatment. Treatment will usually involve some combination of acupuncture, craniosacral therapy treatments, Chinese herbal medicine, dietary changes, and lifestyle modifications. Together, we’ll decide on a number of treatments to begin with and choose a point at which to reevaluate progress. If I determine that you need care outside of my scope of practice, I may refer you for Western medical care, physical therapy, psychotherapy, chiropractic, or massage therapy. If you’re coming for acupuncture and/or craniosacral therapy at this point, we’ll begin the first treatment. Herbs can, in fact, be dangerous just as any medication either prescription or over the counter can be when taken incorrectly. A trained Chinese herbalist has at least two years of education devoted to studying the hundreds of individual herbs and combinations of these herbs that have been used for thousands of years to treat illness. I have studied the effects of each herb that I prescribe individually as well as in combination with other herbs and western medications. I am very cautious with my prescriptions as well as with the distributors I use to obtain my herbs. Would you like to experience the benefits of acupuncture and Chinese herbal medicine for yourself? Great! Call 508-829-8094 or email me today to set up an appointment.